Mrs. Prince and Co.: Free Money Posters: Updated! so thankful for this little break from the routine! I can't believe how fast this year is going! I'm thrilled to be staying in 1st grade next year! but I have a VERY special place in my heart for my 1st grade teammates. And teaching 1st grade has been my favorite grade to teach, too! is I've added a half dollar poster to my Money Posters set! over a year ago, and I FINALLY got around to it! So click the picture below to download your free copy! so I'm sure I'll be back with more this week! glad you could stay in first! I haven't found out what my position will be next year, but I'm assuming it won't change. I teach first too and love it!! Thanks for the update! I had so much trouble trying to find the half dollar clip art when I was trying to make some money activities for my classroom. I have your money posters up year round on my math board. I will be adding the half dollar poster asap! I'm so glad that you posted this, Leanne!! 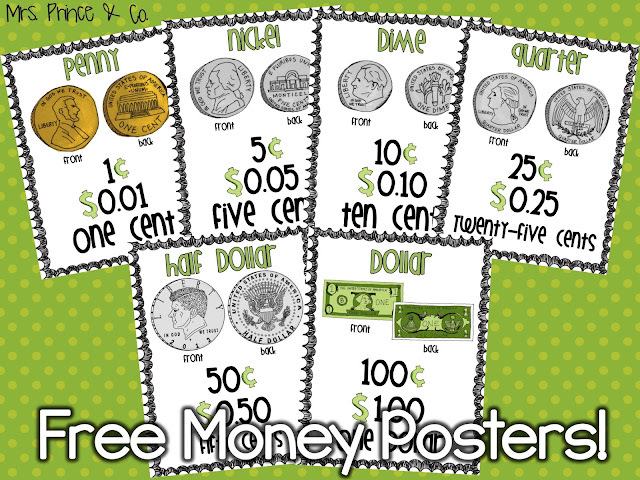 I'm working on a "counting coins" math station and was going to post a link to your money posters on TpT! They are my favorite!! :) For a split second I thought about creating my own, but why mess with a good thing...right?! Thanks for sharing such a great freebie! This will be perfect for our math lessons this week. We aren't on spring break yet. :( 2 more weeks to go! Yay!! ;0) Thank you! We are working on money after spring break and these are awesome. Baseball Centers and April Fluency on SALE! U.S. Regions is done! FINALLY! March Fluency with a Freebie! Visual Plans and Basketball Centers!